First, you have to register. Please fill in all fields and click the register button. You will receive a confirmation email. Please also look in the Spam folder of your email program. After confirming the email, you can sign up and create your teams. 1. 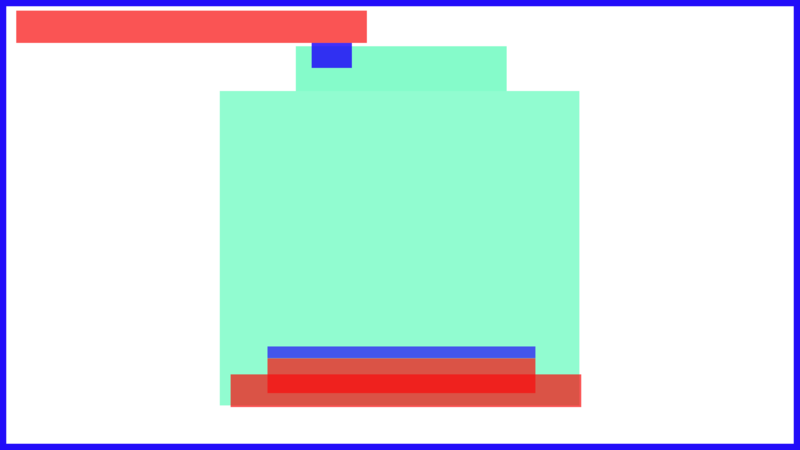 In the first menu item is the control of the scoreboard. 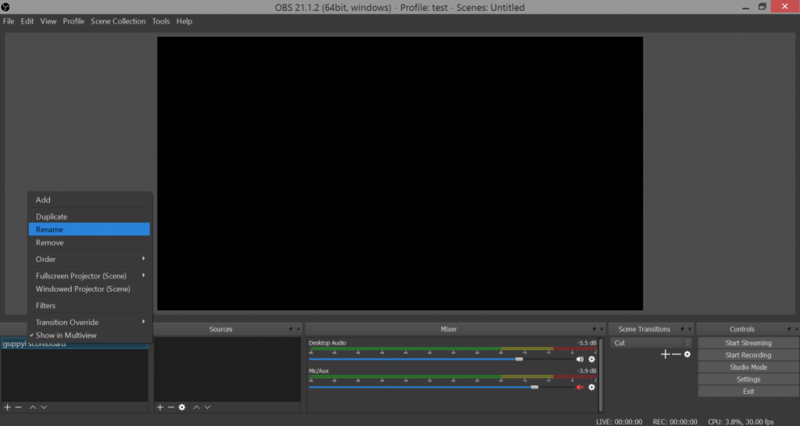 There you can control what you want to show on your stream. 2. 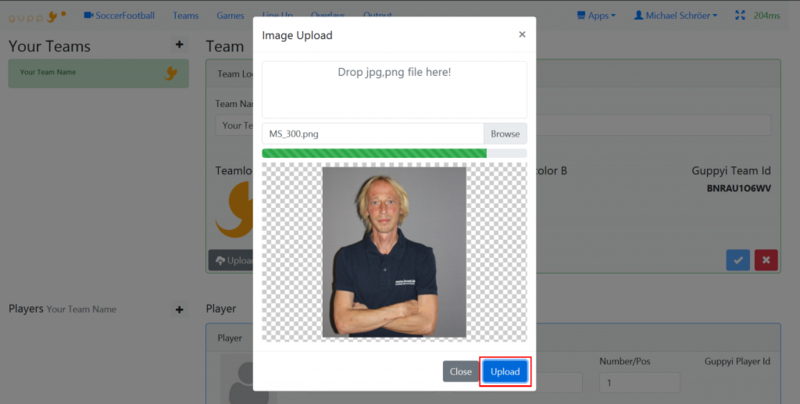 In the second menu item you create your teams, players, upload the club logo and the player pictures. To save the team click on the plus button. 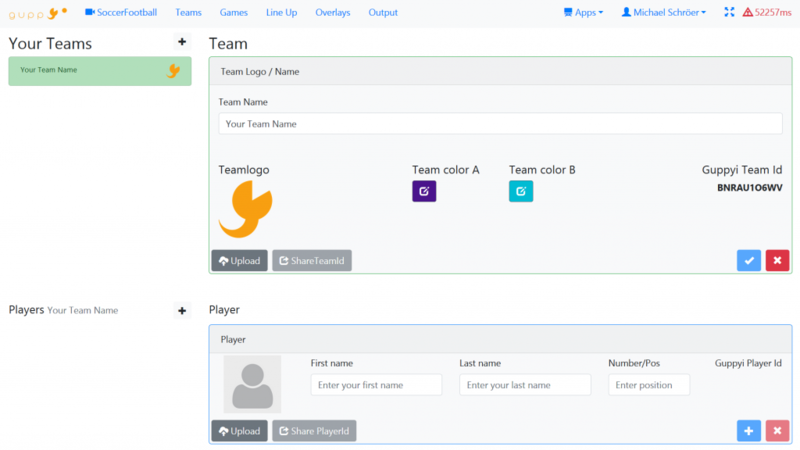 But you can also make all the inputs of your team. setup the team triko color and team logo and then save it. 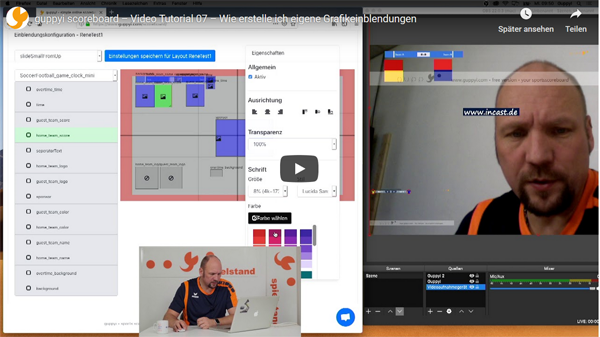 In the next tab, the we show how to setup the triko color. 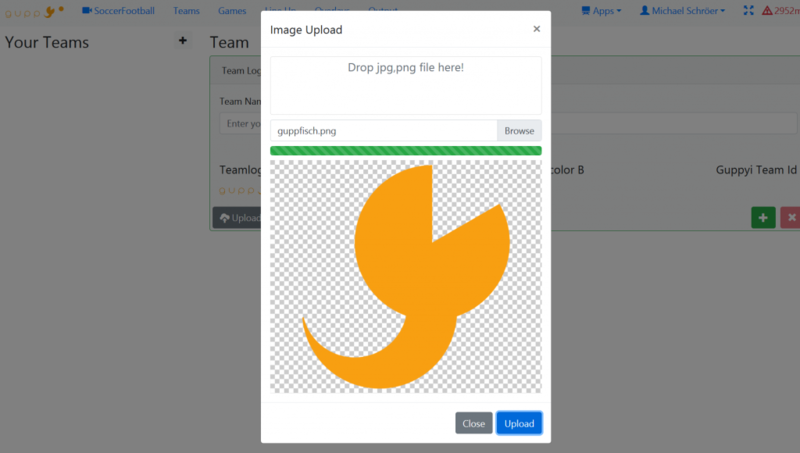 it opens an upload window and you can now either locally on your hard drive to select a logo by clicking on the browse button or you can also just drag a picture in the provided field. The logo must be either a PNG file or a JPG file. PNG has the advantage that you can work with transparent background. Now you have to save your team. Click on the plus button to save. As soon as the team is saved, the team appears on the left side and can be edited at any time. Choose the team you want to edit. And click Plus button. Enter the player surname, lastname and player number or position. The image will be previewed. To upload it you have to click the button upload. 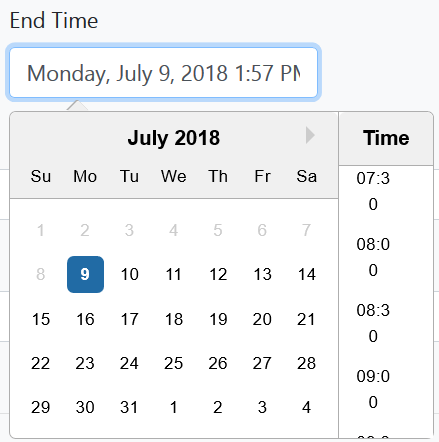 First, you have to set the time period when the game takes place. Among other things, this data is necessary for our future live streaming magazine so that we can announce when which game will take place. 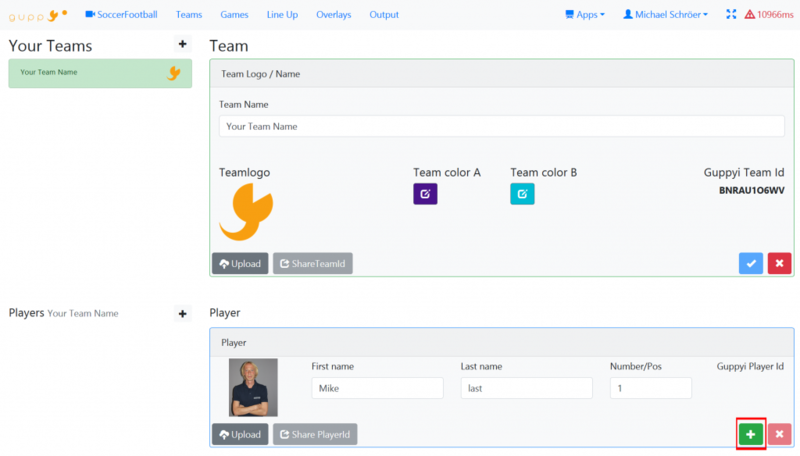 Next you can enter a name for the game, otherwise the teams names will shown. Here you can enter the URL where your livestream can be seen. Next, you choose the teams that play against each other. In the drop down menu all teams which you created appear. After selecting the team, the club logo appears when you have created one. With the visiting team you also have the opportunity to access the user guppyi TeamID and import the team for the game. The enemy team must send you this ID. He must be registered with guppyi as well as you and have created his team there. After selecting the team, the game has to be saved. Click on the plus button and your match will appear on the left side of the page. 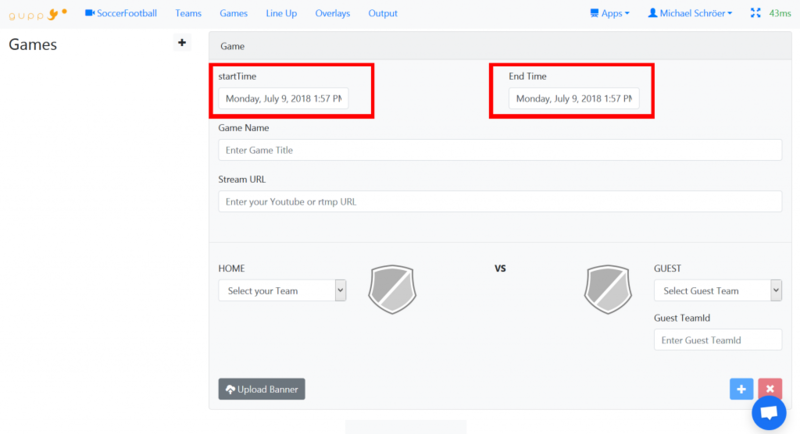 Now you can create more matches or you can do the team line-up. To make the team line-up, click on Line-up in the menu. 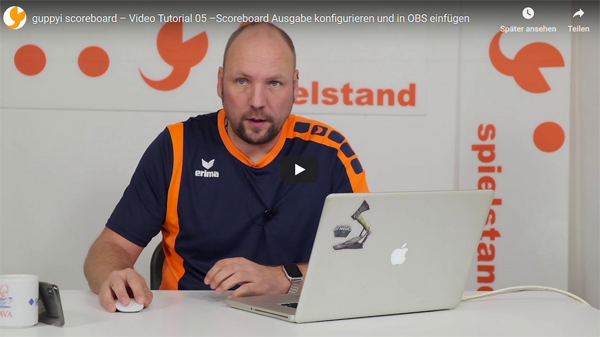 If you do not make a lineup, you can not use some functions in the scoreboard. 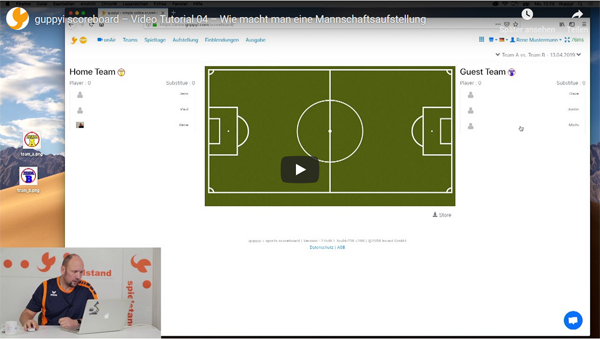 Namely show substitutions, show cards and introduce players. So if you want to use all the functions, the lineup is required. Shown are all the players you have created for the team. Now you can choose the players to play and the substitutes. Click on players once these are the players playing in the starting lineup. The players can now move freely on the field to show the position if necessary. To divide a player as a substitute you have to click on it twice. 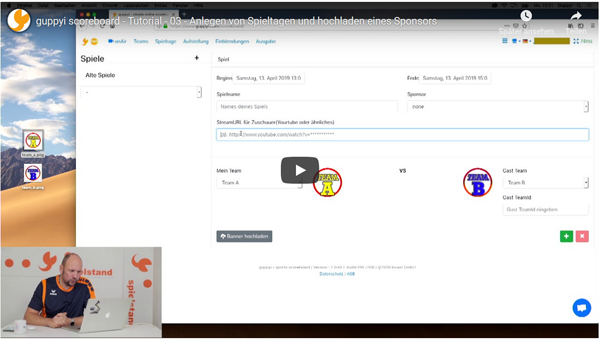 You can upload ad impressions under Advertisement Settings. After uploading the image, you have to give the ad a name and save it. For every advertisement you create a button appears in the scoreboard user interface. In our case, you now see 3 new buttons. Click and your advertisement will be displayed! The template will help you place your ad. The colored areas are located where other elements are placed such as eg. Substitutions, cards, etc. In the graphics program simply place this template as the lowest level and place your advertising on it where there is no colored area. Finally, hide the bottom layer and save and upload the graphic. 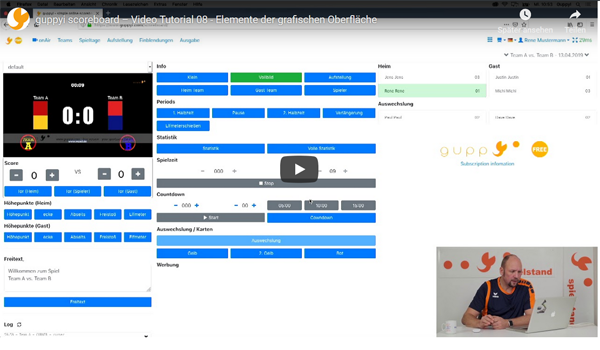 Now you can go to your browser or add it to your streaming software as a browser source. You can generate multiple URLs. 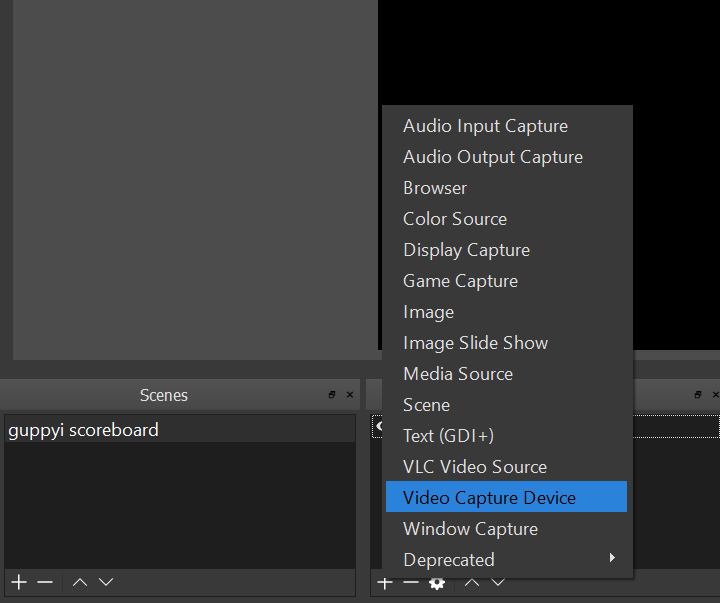 For each recipient or software you need a URL and you have to do these settings before each game. 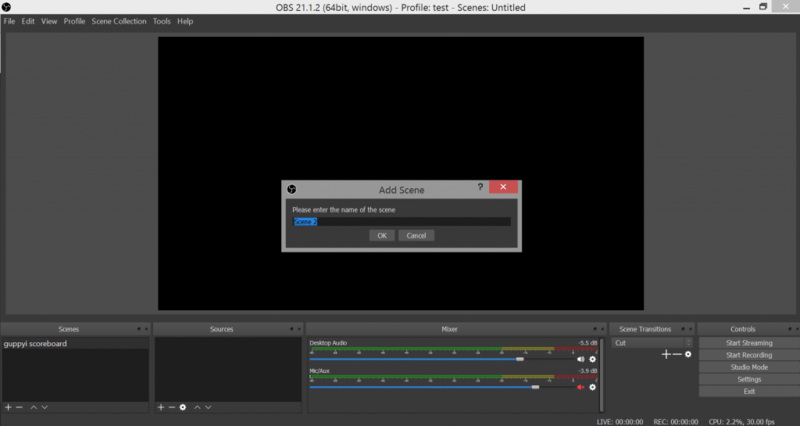 Now you can set what you want to see in the scene. 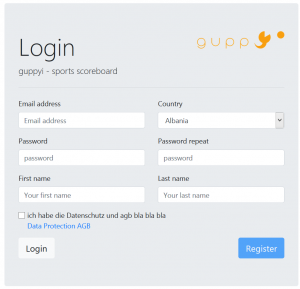 In our case, you want to display the graphic overlays that you control over guppyi scoreboard. 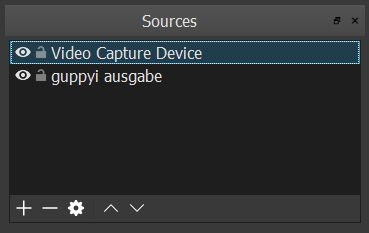 In the tutorial before that, you’ve seen how to create a guppyi output URL that you must insert here as source as follows. You can easily copy the output url by clicking on copy. 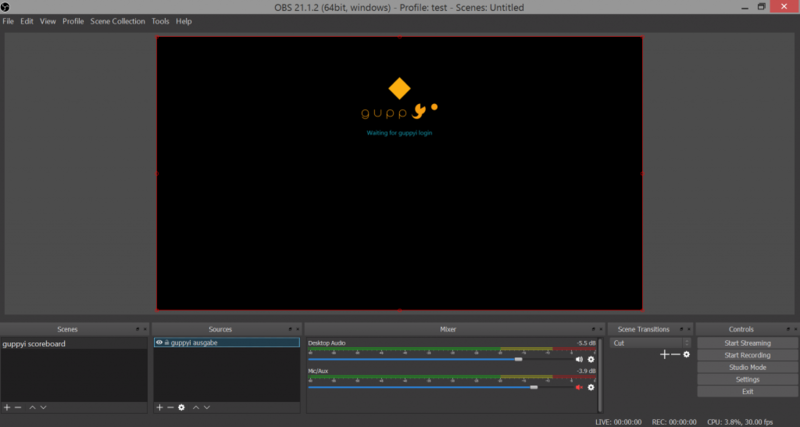 Then you click on the guppyi scoreboard scene you just created and click on plus sign below the Source window. Since you choose Browser Source. 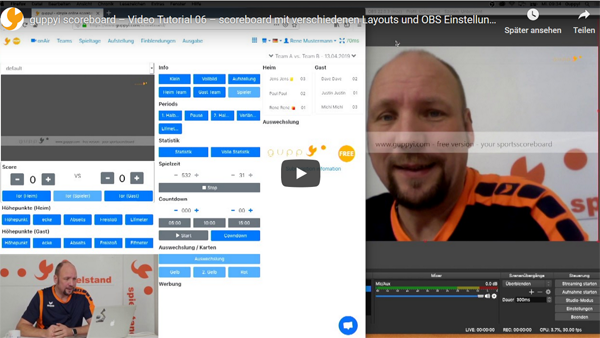 Now a window opens which shows the setting for the Browser Source. 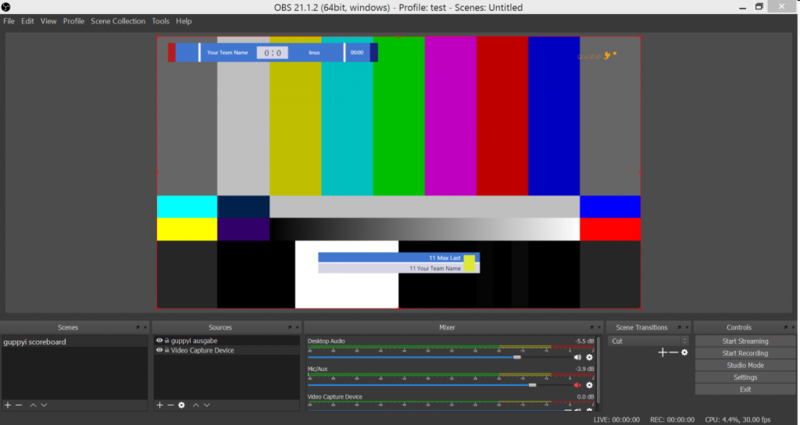 As standard, the website of OBS is displayed. 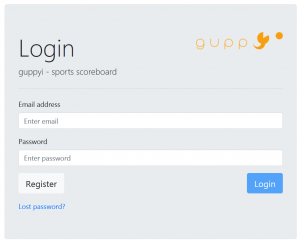 if the page has connection to the server, the guppyi logo will appear in the free version at the top right. 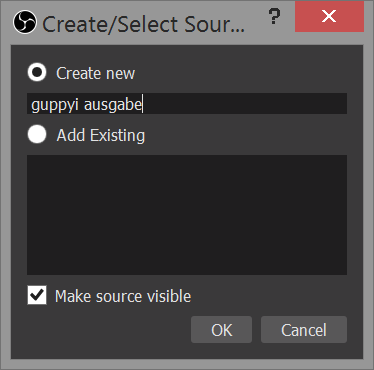 Simply click on a source and use the arrow up or down to arrange the sources so the guppyi output is at the top. 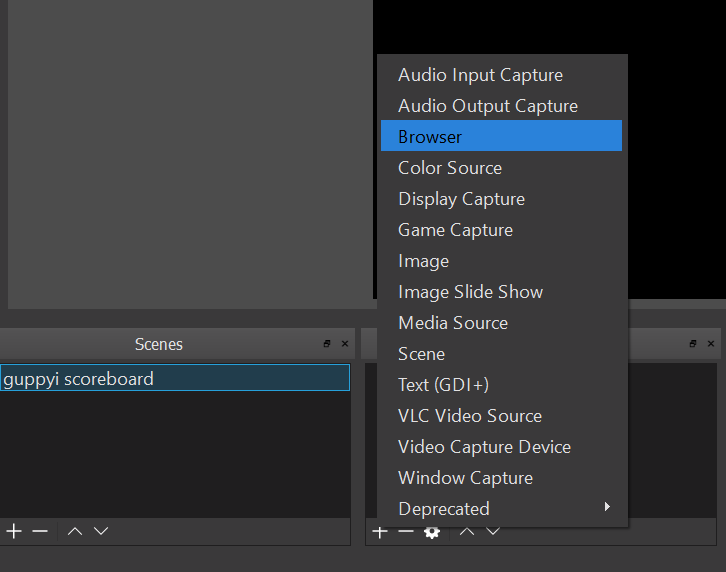 Setting with XSplit are similar see next instructions.